Players try to make as many hexagons of their chosen colour as possible, while at the same time trying to prevent their opponent(s) from making hexagons of their chosen colour. 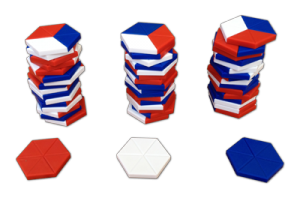 Players may find it useful to separate their tiles into 2 piles according to the colour sequence. The advantage of sorting the tiles becomes clear as the game progresses. The first tile played must be one of the multi-coloured tiles. Play continues in a clockwise direction, with each player in turn placing a tile so that their chosen colour connects to a corresponding colour on the tiles that have already been played. Players must position their tile so that their chosen colour connects with the corresponding colour on a tile that has already been played. (See Fig. 2 & 3) If more than one side touches tiles already in play, then all colours on the sides that touch must match. Blocking moves may be achieved by placing tiles that prevent opponents making a valid move. If a player cannot make a valid move, play passes to the next player. The solid colour tiles may be used at any time after the first move. Hexagons formed around a solid colour tile are scored in the normal way. A solid colour tile does not count as a completed hexagon on its own. Play continues until all tiles have been played , or until no more valid moves are possible. One point is awarded per completed Hexagon. The winner is the player with the most completed Hexagons at the end of the game. Figs. 4, 5 and 6 all show tiles in positions where the colours do not match and so the moves are illegal. In Figure 4 the red side of the new tile must be placed against the red side of an existing tile. In Fig. 5 the red side on the new tile does not match the white side on the existing tile. In Fig. 6 no tiles can be laid in this position as there is no tile with white on opposite sides. 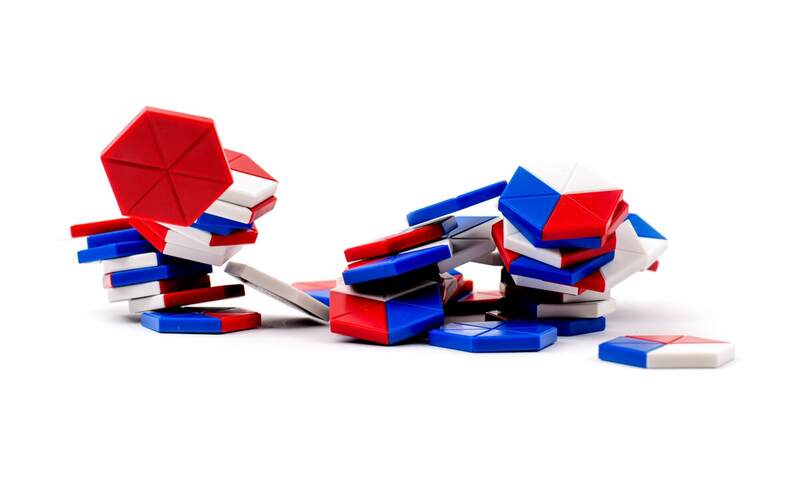 For an easier way to play, why not try the “Pass the Bag” version of HexAgony. The aim of the game is the same, the scoring is the same, but instead of dividing the tiles out at the start of the game, choose a colour and take the corresponding solid counter, and when it’s your turn simply draw a tile from the bag and play it where you can. Full instructions can be found here on the Game Variations page.